On an afternoon in early May members of the Smart Museum's Student Advisory Committee, along with Smart Museum staff, visited the studio of first year Department of Visual Arts MFA student Kevin Pang. Kevin was a finalist, and eventual winner, of the first ever MFA award for the Art to Live With program. Five MFA students submitted their works for consideration to be included in the collection, which is loaned out to UChicago students each year. We went to Kevin's studio to view his art in person, and to learn more about what art and art making means to him. Entering Kevin's studio, we were all taken aback by how his studio was decorated. Swirling lines form patterns on the floors and walls. One wall is covered in Chinese characters along with "yes," in English, in a stylized calligraphy. The characters, Kevin later informed us, don't correspond to any words or letters, but were of his own invention. He's interested in exploring the lines and formal qualities that make up characters; the characters, when separated from their linguistic meaning, represent to him a type of abstract expressionism, and are meaningful for their own formal qualities. On the floor were some of the pieces Kevin submitted in his application for the MFA award, including steel medallions. Kevin has welded lines and patterns into these pieces with the same flowing and aquatic style of the painted lines on his studio walls. It’s all very ephemeral and fleeting. Even in the metal pieces, the lines seemed quick and natural, as if the patterns might change if you looked away for more than a short moment. Hanging on the walls were additional pieces that Kevin submitted for consideration for the Art to Live With collection. These ink drawings on paper are similar to the welded works. Gradations of ink, from dark black to a nearly transparent grey-white, decorate the rice paper sheets. The designs are so fluid that one Advisory Committee member remarked that she is reminded of ink dropped into a pool of water. Because it’s a work on paper that will soon hang in a dorm room, we wanted to know more about his process for these pieces in particular. Before starting to paint, Kevin meditates, and thinks about the emotions and thoughts that will become the subject of his work. He expresses these feelings and ideas in a completely formal way, accessing them through line alone. He told us that he feels he is not yet done exploring the line and what lines can mean to both artist and viewer. This is why he’s currently working in only black and white; he said he’ll one day add color but right now he wants to make sure he can isolate what the line is expressing. If he were to paint in red, would the emotion evoked be a result of the brushstroke, or the color? The effect of the black and white designs was very calming, a feeling that a UChicago student could appreciate in the middle of 8th week midterms, with finals just around the corner. Kevin acknowledged this too. He’s going to create a brand new work for the Art to Live With collection, with UChicago students in mind. During his pre-painting meditation for this piece, he’s going to think about student life and its ups and downs. Perhaps, he’ll imagine long hours in the Reg, or now that Spring is (finally) here, sunny afternoons on the Quad. Along with his interest in the abstract expressionism of the deceptively simple line, Kevin’s art is inspired by and shaped by his own experiences. He was born Greenville, South Carolina, and lived in France at a young age before returning to the US. Shortly after graduating college went to China to study calligraphy. He sees his art as a way to bridge the two worlds that define who he is; his mother is American, and his father Chinese. Kevin spoke of his three years in China as very formative for his art, and it was in his final months in China that he began exploring calligraphic welding. It was also while studying calligraphy that he came to see the brushstroke and characters as abstract expressionism. He expressed a desire to “master that brushstroke.” One gets that sense that he is starting to see himself as in control of the brush, and he is now starting to do smaller, figural drawings. I was struck by how he described the relationship of abstract and figural art; he wanted to master the abstract first, and he described the abstract as foundational to the figural. Representational art, to him, is the synthesis of the abstract expressionism of the brushstrokes he wants to master. After leaving Kevin’s studio, there was a unanimous excitement about his work as an addition to the current Art to Live With collection. We all felt that the way he spoke about the art, and the ideas he has, are ones that could be appreciated and discussed by UChicago students over the course of a year while living with the art. Because Kevin’s work will be a new commission, we don’t know exactly what we’ll be seeing next Fall at the Art-B-Q, but we’re confident whatever Kevin makes will be a welcome addition to the collection, and will bring art and beauty into the dorms. 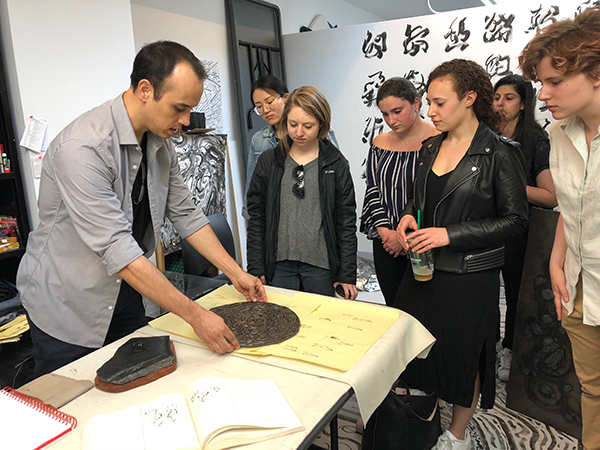 A new work by Kevin Pang will be added to the Art to Live With collection and will be made available to students living in University of Chicago residence halls during the 2018–2019 academic year. Students will have the opportunity to preview works during the ART-B-Q on October 4, 2018, 5–8pm and select works during Art Match on October 7, 2018, 8am–noon.